No artist embodies the idea of Pop Art better than Andy Warhol. A concern with consumerist imagery, the imitation of advertising language, and a cold, serial and seemingly anonymous style, were the mainstays of his research that matured at the beginning of the 1960s and continued to develop until the mid-1980s. It would be reductive, however, to identify him solely with the Pop phenomenon. Warhol represented much more, to the extent of personifying the new image of the contemporary artist, not as a maladjusted genius but a successful man and shrewd promoter of himself and his Factory, capable of setting trends both in lifestyle and music. This happened partly because he virtually rocketed to international fame, on a par with that of the Hollywood stars he obsessively portrayed in his works. A complex individual, who was completely unreadable at times, Warhol painstakingly constructed his public persona. We are as familiar with his bizarre appearance as we are with his works: skinny, always toting a Polaroid camera, and hair of unnatural color. The pithy, mordant remarks he made throughout his career did the rest: disarming maxims delivered with a mix of naïveté and detached irony, which left the listener wondering where the provocation ended and cynicism began. The exhibition Andy Warhol. Two Major Works from the Collection of Francesco Federico Cerruti curated by Fabio Belloni presents for the first time at Castello di Rivoli the works by Warhol previously at Villa Cerruti, the private residence built in Rivoli by the Turin entrepreneur to house his art collection. Executed during the artist’s late period, they reveal his interest in new subjects and means of expression. Hélène Rochas, 1974, is one of the pieces the artist devoted to the former French model and CEO of the perfume company of the same name, known for her entrepreneurship, cosmopolitan lifestyle and natural elegance. Like other works of the same period, the Rochas portrait was the fruit of a long Polaroid photographic session. Warhol would choose the shot he wanted to use then have his assistants silkscreen it on a canvas that was already painted with broad brushstrokes in acrylic – mainly green in the case of this work. Madame Rochas’ gaze is extraordinarily seductive: she has become ageless. The transposition of the photo to silkscreen has also eliminated any chiaroscuro effects, while the relationship between the figure and background is sacrificed to the ambiguous interaction between the planes. 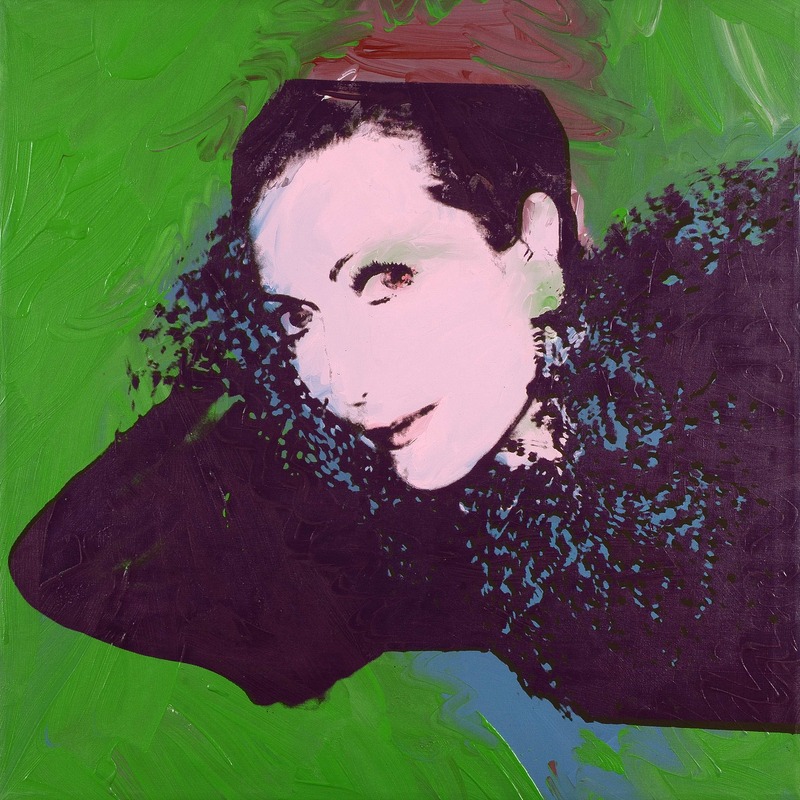 The piece is one of the so-called “Vanity Portraits”, which Warhol executed on commission one after the other from the beginning of the 1970s, when he resumed painting after years of experimental cinema. He usually produced various versions of these portraits: the first for the commissioner, which was generally the most expensive; the others for the market. Andy Warhol was born in Pittsburg in 1928 to Czechoslovakian immigrant parents. At seventeen he enrolled in the drawing and decorative arts courses at the Carnegie Institute of Technology. In 1949 he moved to New York, where he began to work as an illustrator for fashion magazines and advertising agencies. He switched to painting in 1960. A couple of years later he began to work with silkscreen, a technique that made execution impersonal and also gave him the possibility of reproducing a potentially infinite number of prints while maintaining the original quality. “The reason I’m painting this way,” he said in 1967, “is that I want to be a machine, and I feel that whatever I do and do machine-like, is what I want to do. I think everybody should be a machine.” In 1963 Warhol moved his studio to a large loft on 47th Street, where, with the help of a team of assistants, he expanded his creative activity. The Factory – which was the name given to his workshop – produced silkscreen prints, but also photographic and cinematic works. The iconography was certainly wide-ranging: themes of violent death (victims of an airplane crash, the electric chair); Hollywood celebrities (Marilyn Monroe, Elvis Presley, Liz Taylor) and typical American food and beverage products (Coca-Cola bottles, Campell’s soup cans). In his last years, the artist also devoted himself to television and publishing projects. At the same time, he began to revisit the great masterpieces of the past (from Leonardo to de Chirico) and also collaborated with new-generation artists. He died in 1987, from complications following surgery. Francesco Federico Cerruti was born in Genoa on January 1, 1922 to Giuseppe (1890–1972) and Ines Castagneto (1892–1977). His father, of modest economic means and an employee of a bookbinder in Genoa, moved to Turin with his family the following year, when Francesco’s sister Andreina was born (January 19, 1923). Giuseppe, who had been sent to Turin by his company in Genoa to open a branch office, soon opened his own binding business. Francesco Federico’s childhood stands out for his strict and severe education. He and his siblings were involved in the family business at an early age; in fact, their father forced them to bind books in their kitchen when they came home from school. Such an austere and rigid upbringing greatly influenced the schooling and personality of Francesco Federico, who, for his entire life, always kept a simple and, at times, intransigent lifestyle. After earning his diploma in accounting in the summer of 1940 at the Istituto tecnico commerciale G. Sommelier, Francesco Federico immediately joined his father’s business, followed by his sister one year later. The 1943 bombings completely destroyed the factory which at the time was located on Corso San Maurizio, right near the city center. After the war, the “accountant,” as he was nicknamed, demonstrated such great organizational skills and immense spirit for innovation that he relaunched the family business, renaming it the Legatoria Industriale Torinese. After visiting the United States in October 1957, he introduced the American technique of “perfect binding,” a procedure that did not require stitching. He made his own machines to industrialize binding— which up then was mainly artisanal—and patented specific techniques. Thanks to his brilliance, the LIT reached top levels of production, with numerous commissions for art books and, above all, Italian telephone books. This spirit of entrepreneurship was joined with his love for beauty, based on his own elegance and profound intuition, which led him to create one of the most important art collections in Europe. In addition to his passion for beauty and his farsightedness in business, he also possessed a feeling of compassion and charity as a benefactor, but always in his rigorous and detached style, far from the spotlight. After a long illness, he died in Turin on July 15, 2015.